Ralph DeMayo, GSS ’51, a onetime New York City police officer who taught social work at Fordham and later led a transformation of alumni relations as a Fordham administrator, died at his Staten Island home on Dec. 11. He was 94. DeMayo was a devout Catholic who thrived on service, loved to sing, and inspired his coworkers through his warmth, creative flair, and sheer attentiveness, family and former colleagues said. By the time he retired from Fordham in 1992, he had been a Fordham student, professor, alumni volunteer, parent, and administrator—one who left an indelible impression on everyone he worked with. “He really made you feel like you were the center of attention. He had that ability with everybody,” said Edward Buckley, FCRH ’81, GSE ’87, who worked with DeMayo as deputy director of alumni relations. Ralph DeMayo was born in 1922 in Queens, earned his bachelor’s degree from St. John’s University, and served as a Navy ensign during World War II. He joined the New York Police Department after the war and served as a patrolman and, later, as program director with the Police Athletic League before retiring from the department in 1963. While he was a patrolman, the police department paid for him to earn his master’s degree in social work from Fordham’s Graduate School of Social Service, part of a city effort to train police for their anti-gang efforts, said DeMayo’s daughter, Janet Sabol. He later taught in the graduate school at night, going to class straight from work, still dressed for his day job. “We used to joke with him that he never had any discipline problems,” said Buckley. And DeMayo took no salary. The NYPD forbade paid moonlighting at the time, Sabol said. In the mid-1960s he became director of annual giving at Fordham, and enlivened the University’s fundraising phone-a-thons by adding a touch of tintinnabulation. Each volunteer caller had a small cowbell and would ring it whenever someone made a pledge, signaling to people on other calls that “we just got another gift for Fordham,” said Robert Buckley, FCRH ’70, Edward Buckley’s brother, who worked with DeMayo in the development office as part of work-study. 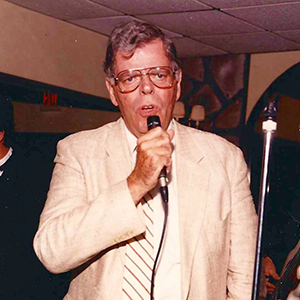 Ralph DeMayo, shown singing at his godson’s wedding in 1989. DeMayo left Fordham in 1969 for a development position at Hunter College and returned in 1976 to become director of alumni relations. As director, he would launch one of the nation’s most ambitious, innovative alumni relations programs, making full use of Fordham’s New York City location, according to Edward Buckley. New efforts included regional chapters, trips abroad, a life insurance program, young alumni socials, and a variety of other alumni events. “It was constant activity,” to the tune of 180 events a year on average, Buckley said. DeMayo was later named associate vice president for institutional advancement. He often led a unique rendition of “The Twelve Days of Christmas” at Fordham’s holiday parties, Buckley said; DeMayo also sang with the Big Apple Barbershop Chorus and was choir director at St. Ann Church in Staten Island for 55 years, according to the obituary prepared by his family. He was active in service organizations outside Fordham. In 1970, he co-founded the agency that grew into the New York Center for Interpersonal Development, based in Staten Island, Sabol said. Robert Buckley recalled the many ways that DeMayo supported him: encouraging him to pursue his M.B.A., giving him rides home from the Rose Hill campus, even dropping everything to buy him a drink after he’d been robbed—and taking him to a police precinct to look at mug shots. Once, during a ride home, DeMayo encouraged him to talk through a difficult presentation he soon had to make for a philosophy class. It was just what Buckley needed. DeMayo is survived by his wife of 70 years, Mary Flanagan; his children, Barbara DeMayo, Janet Sabol, and Vincent DeMayo, GABELLI ’69; three grandchildren; and five great-grandchildren.